It seems Apple is planning to promote the sales of iPhone 6 plus or iPad Air 2 as it didn’t give much importance while announcing the iPad Mini 3. It’s pretty much the same device in gold colour with Touch ID feature and increased capacity of internal storage. Apple has kept the display exactly the same with 7.9-inch screen size and resolution of 2048*1536 with the same old clarity of 326 PPI. The tablet comes with the aluminium chassis pretty much the same design of iPad mini with retina display and it’s weighing about 341 gm. It’s got the same A7 64-bit processor and M7 motion coprocessor from last year with iOS 8 operating system. That’s hugely disappointing as it’s the same chip which featured in last year’s iPad and iPhone while the iPad Air 2 gets new A8X processor. It’s exactly the same weight and has got the same dimensions. 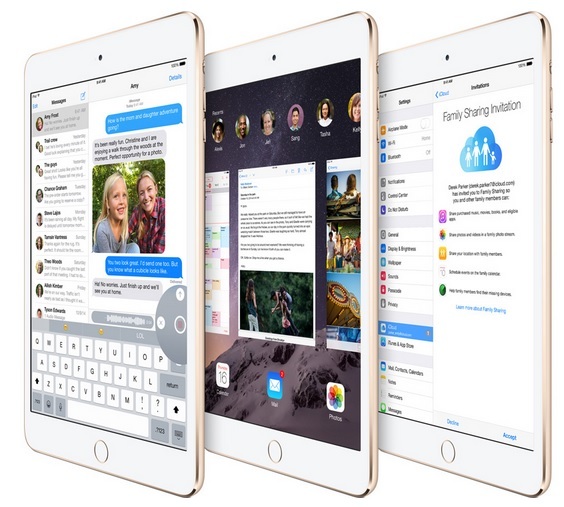 This is one significant feature that makes iPad mini 3 different from the previous generation. The most secured way of unlocking a device and using your finger print you will be able to unlock the device as well as various apps from store. The NFC support apple has on iPhone 6 is not included as it’s too big and everyone won’t carry this device to the stores for purchase. iPad mini 3 has a 5MP iSight HD camera which can capture 1080p video and 1.2 MP face time HD camera. Apple says the battery will last for 10 hours and both the camera and battery specs have no difference from the previous one. If you have iPad mini2, then there is no reason to upgrade to the iPad mini 3 or else you should be a huge fan of new feature Touch ID or need more internal storage space or you love the gold colour.